Hospital stays after you’ve had a baby can either be terrific (a holiday for me as I didn’t have to cook) or not-so-fabulous (just want to be home in your own surrounds). Either way, there is one thing hospitals have that lots of new mothers would love to have at home – the clear Perspex bassinettes that let you gaze at your new wonder from all angles. Now you can. French designer Castor & Chouca have developed the superb Hop! Hop! Hop! bassinette. 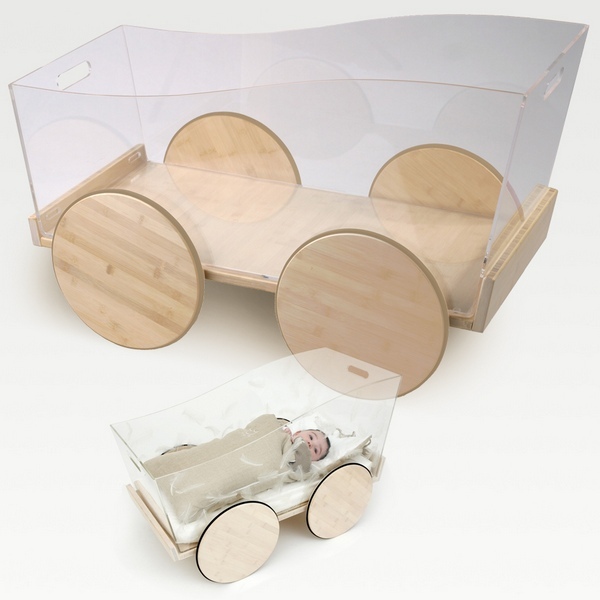 Made of bamboo slats and plexiglass the bassinette is perfect for long, loving looks at your baby. Inspired by the utilitarian models used in hospitals, Castor & Chouca have created a bassinette that is practical and beautiful. Continue Castor & Chouca style in the nursery with the Soleil cot that converts to a play table – we reviewed it here in February this year. The Hop! Hop! Hop! bassinette as a trolley (shown above) is €590 and is available from Kids Love Design, who deliver to Australia.